Gotta ask, are there a lot of pudding people out there?? 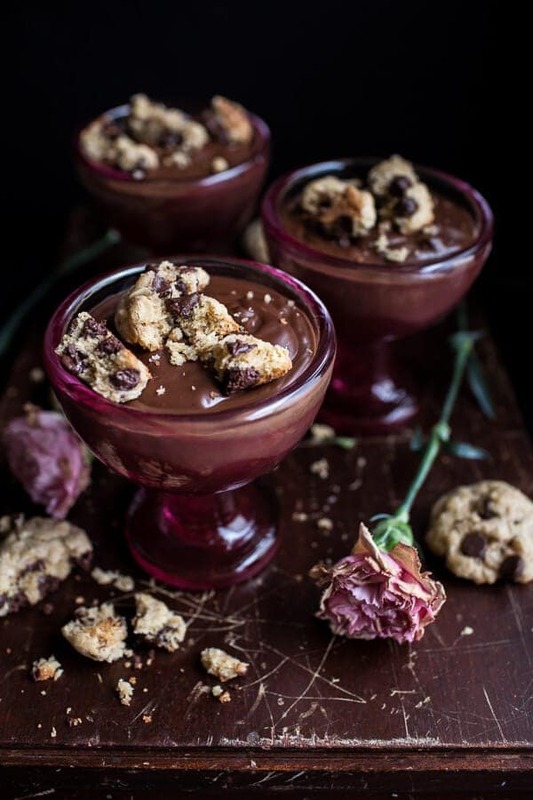 Clearly I am hoping so, because today is all about pudding…with cookies!! 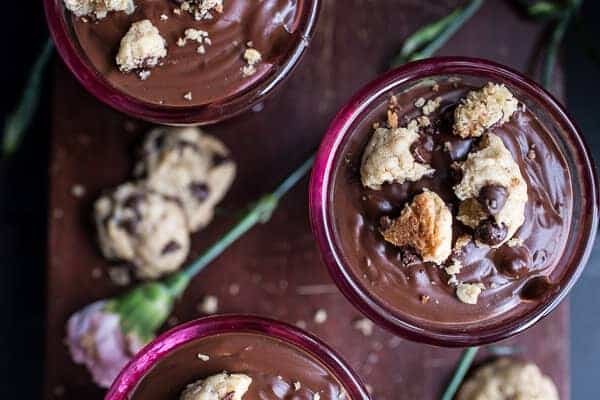 And one of my favorite parts about this Kahlúa chocolate pudding is that it’s so simple and easy, and if you like, you can literally eat it warm right off the stove with freshly baked oatmeal cookies. It’s just as cozy and delicious as it sounds. For some reason, pudding and cookies sounded like a really good combo to me. You know how pudding is super smooth and silky? Yeah, well I love that, BUT I also love a ton of texture. Cookies add that texture and let’s be honest, pudding and cookies should make us all feel like kids again. Ahh, but wait??! I don’t actually remember eating pudding as a kid. Oatmeal cookies, yes, but not really pudding. Whatever. I am eating it now, only this version is a little more grown up because um….Kahlúa! Kahlúa to me gives everything more flavor. Mom always used it in her desserts growing up and even though I was a kid, I still somehow managed to eat my fair share of her boozed up desserts. Granted, Kahlúa doesn’t really have that high of an alcohol content and I would imagine that most of the alcohol was baked it out, so yeah, it probably wasn’t that big of a deal. Anyway, this pudding is beyond easy to make. It’ll take you thirty minutes at most and like I said, you can eat it warm right out of the pot if needed. I mean, it’s cold in February and I wouldn’t blame you for just grabbing a spoon, adding a cookie or two and just digging in. Oh and for the cookies? I used my mom’s FAMOUS oatmeal chocolate chip cookies. And I say famous because it seems like so many of you have tried these cookies and loved them. See, there is a reason I call them THE BEST. Perfect for a Tuesday dessert or even better for Valentine’s Day, which for some reason, I have really gotten into this year. And when I say gotten into, I really just mean making some good food with that day in mind. Honestly, I could kind of care less about V-Day, it’s not like I dislike it, I just don’t really get excited about it. BUT cooking-wise, it’s kind of fun to have a theme for recipes, so I’m just going to go with it. The good news is we can still make and eat these recipes year round. YES. Sorry for the short post today. 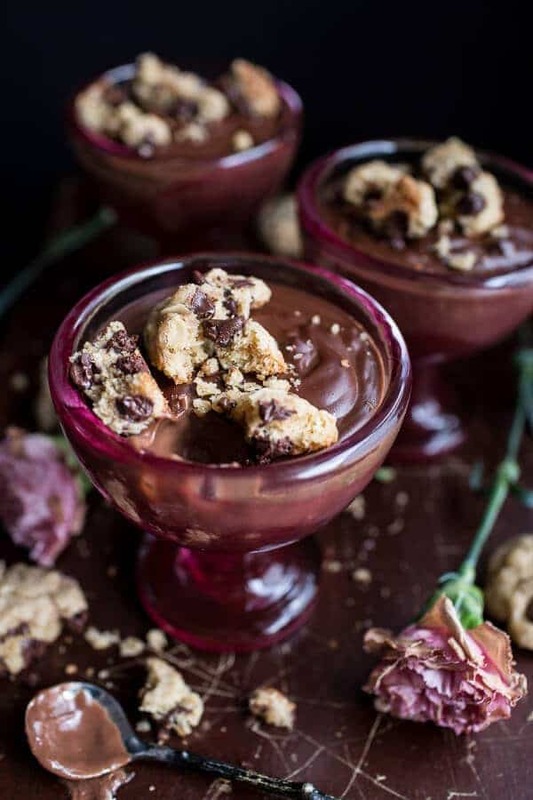 Apparently, all I can think about is this pudding and warm cookies… and the fact that I don’t have any left. Kahlúa Chocolate Pudding...with Oatmeal Chocolate Chip Cookies. Warm the milk in a saucepan over a low heat. Mix the flour, sugar, egg yolks and vanilla seeds in a separate saucepan until smooth, then whisk in the warm milk, a little at a time, until smooth. Place the pan onto the heat and cook over a gentle heat for 2-3 minutes, stirring continuously. Whisk in the Kahlúa and continue to whisk until the mixture thickens, about 15-25 minutes. 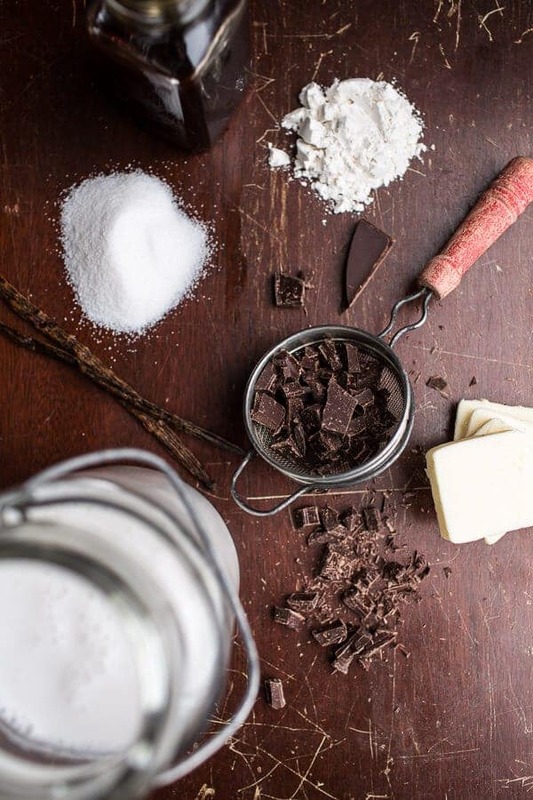 Remove the pan from the heat and stir in the chocolate and butter until melted and smooth. To serve, spoon the mixture into serving glasses. 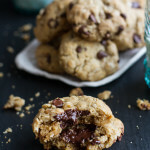 If eating warm, sprinkle with lightly crushed [Chocolate Chip Oatmeal Cookies | https://www.halfbakedharvest.com/moms-simple-oatmeal-chocolate-chip-cookies-best-oatmeal-chocolate-chip-cookies-around/]. 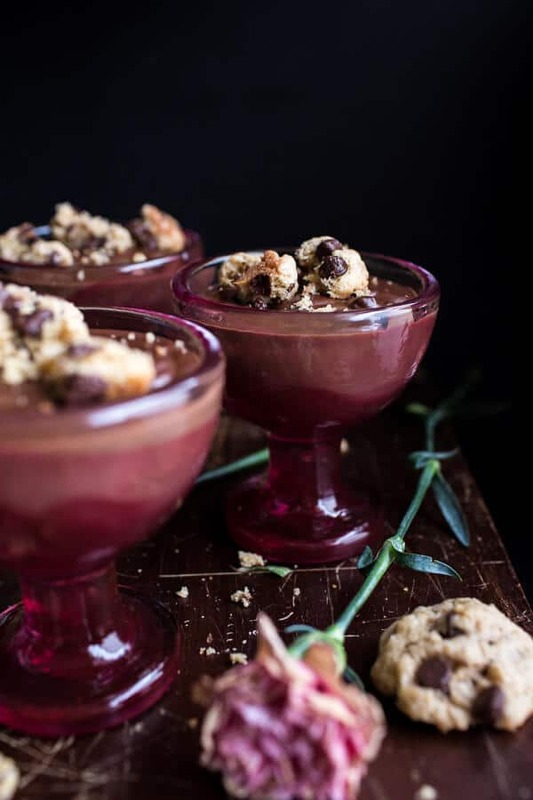 To chill the pudding, cover the serving glasses and place in the fridge, serve as directed above with warm cookies. Thinking now is a good time to make some more. Yup. Now it is! It looks good but I’m a tapioca person but I do love oatmeal cookies. Thanks Nancy!! Tapioca is delish!! Today is my birthday and whats better than celebrating with this delicious dessert. It will be made and shared with family and friends tonight ! 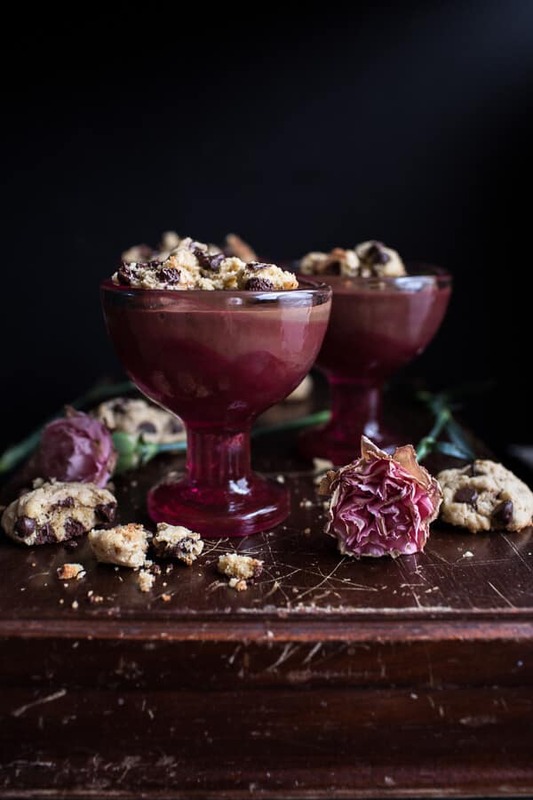 I always think of pudding as quite a childish dessert, but these glasses look incredibly sophisticated and perfect for Valentine’s Day dessert! I love pudding, and homemade pudding is the best! 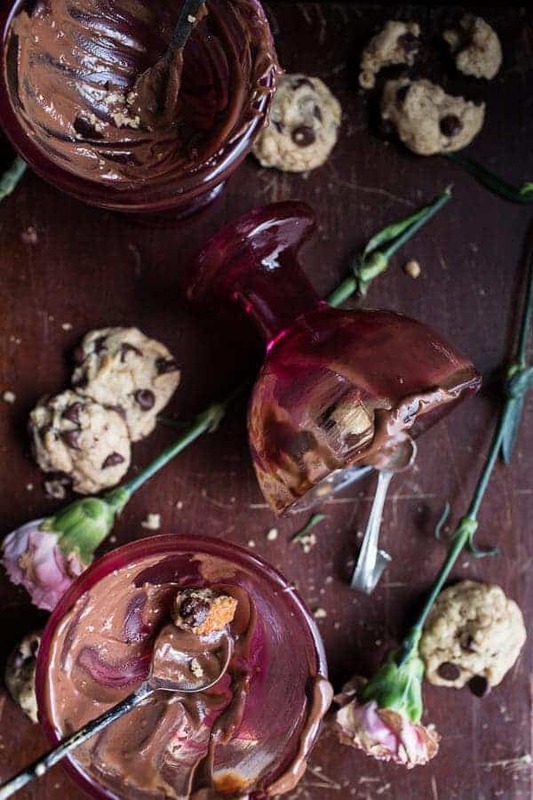 I love the idea of putting cookies on top…just like cookies and milk…yum! Oh my oh my! This looks spectacular and seems pretty easy! 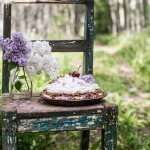 I think this will have to go the VDay menu Tieghan – oh and I love the photos for this shoot, with the flowers! So great! Pudding was always my favorite dessert as a child but for some reason I never dared to make it myself once I grew up. 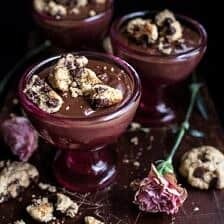 Your combination of cookies, Kahlua and pudding sound so delicious that I expected a very difficult recipe but this is just too easy!! I guess tomorrow it’s pudding time! Omgosh this looks so good! I love the combo of a crunch cookie with the creamy pudding. Pinned this recipe! Chocolate perfection. And I’m totally digging those pretty glasses! Oh my gosh, it should be illegal to see this kind of food before noon! Hahaha amazing! I’m a pudding person for sure! Actually, I just finished making vanilla pudding for a recipe I’m working on. So ironic! I love these, Tieghan! Pinned! Thanks Tori!! Bet that vanilla pudding is awesome! 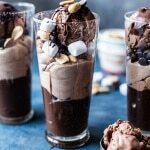 I’m a total pudding guy, love the stuff and this looks sinful!! I need this is my life, now! Looks SO good!!!! I just made the cookies this morning, they are great. I add some toasted coconut to mine and I got 40 cookies from this recipe – more to share with others. Thank you so very much for these wonderful recipes, I love trying new ones and you give me such a variety. I first discovered your blog through those oatmeal cookies and I love seeing them back! I never actually had pudding that much as a child, but this is definitely the time for me to get into it, because this looks so amazing! I’m a sucker for texture too which is why I’m really not a huge fan of pudding. This one? Definitely a fan. That cookie is the perfect contrast to the pudding. I’m not a huge fan of pudding (probably because I ate too many pudding Snack-Packs in elementary school), but I’m willing to give this a try! Kahlua AND chocolate chip oatmeal cookies?! Now, you’re speaking my language! Brilliant. Thanks! I agree and thank you so much!! 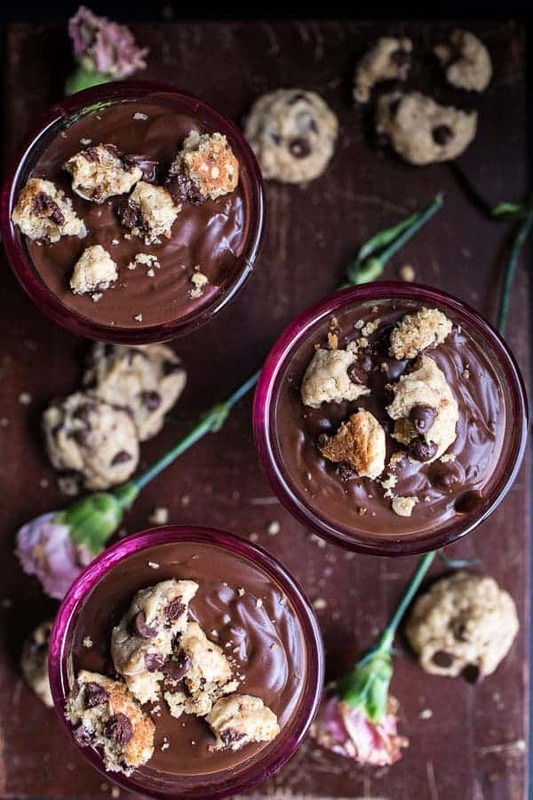 Pudding and cookies = genius! Why no one ever thought about doing that combo before, I don’t know. I’m not a huge just-pudding fan but with cookies? And homemade? YES!! Pinned! My big comfort food is rice pudding. Or tapioca. I know, I’m weird. 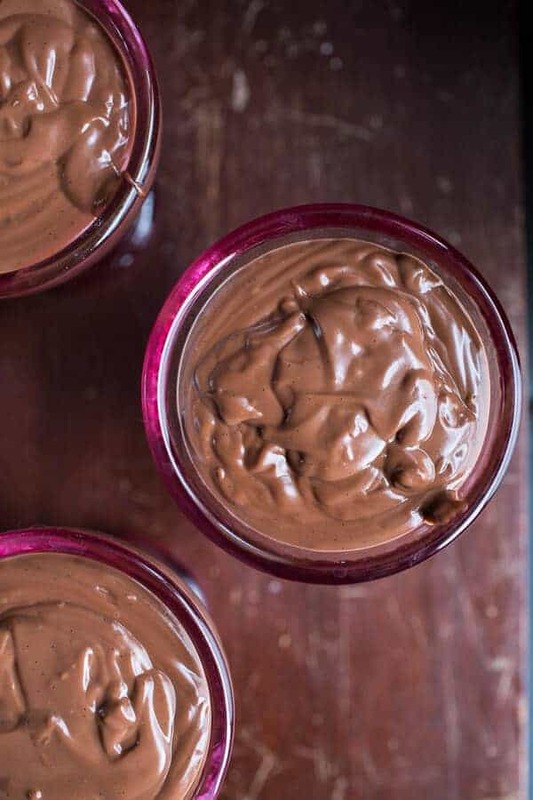 Chocolate is fabulous too… I mean, who doesn’t like chocolate pudding? It’s kind of the best. I made this pudding last night and the flavor was great (though I may been a tad overzealous with the Kahlua haha) but it would not thicken at all! I added two more tablespoons of flour and refrigerated it overnight to no avail. It came out as more of a gloopy chocolate sauce. 🙁 Any ideas as to what may have caused this? Hey Priscilla! How long did you cook the pudding for? mine took a long time to thicken, but it did thicken up. Did you add the eggs? I did add the eggs, then when it didn’t thicken after 10 minutes I added more flour and did probably another 10 minutes. I live in the mountains so maybe it’s the elevation? I’m going to dry to reheat it tonight and add a bit of cornstarch! I am in the mountains too, so I do not think thats it. Weird. I knew there was a reason I still had Kahlua in my cupboard. Thanks for the great idea! Made this tonight – it was so quick and easy, a great dessert to go for when I couldn’t be bothered making something long. And the lack of waiting time (unlike something like a mousse) was much appreciated by us all! Thanks so much 🙂 I’m only 15 so obviously I didn’t use the Kahlua, but I did add in some crumbled cookies and cherry pieces. Thanks! That is awesome! So happy you enjoyed this! THANKS! Haven’t made the pudding yet. 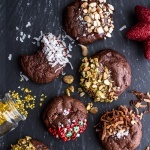 Cookies are perfection – I want to try a few with raisins too. Thank you! Can I use vanilla extract instead of a vanilla bean, or will the additional liquid make the whole pudding too runny? I’m afraid of having the outcome that the other reader had, where her pudding didn’t end up thickening… But the recipe looks great, and I plan on serving it w/ whipped coconut cream! just a technical question: why do you use flour and not cornstarch, like we usually see in puddings? Hey! I just use flour because I always have it on hand and i find it works great! Let me know if you have questions. Thanks! 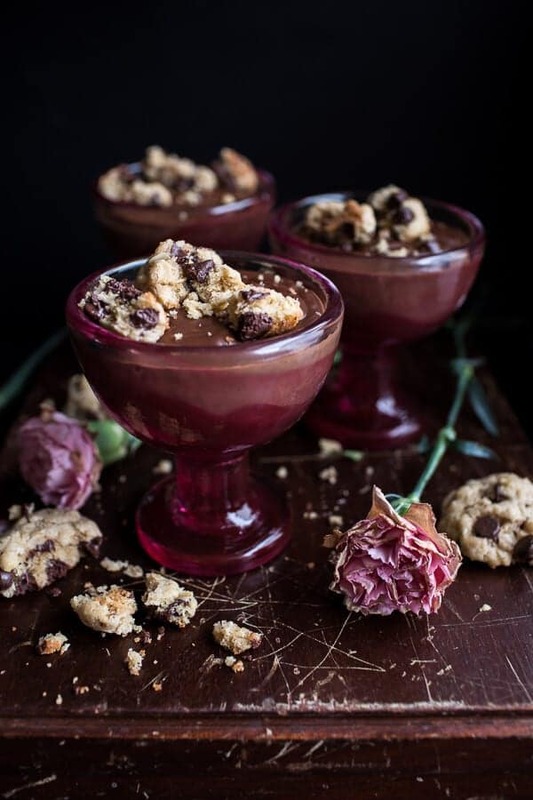 Wow, great combination, would never have thought pudding and cookies together, works so good! 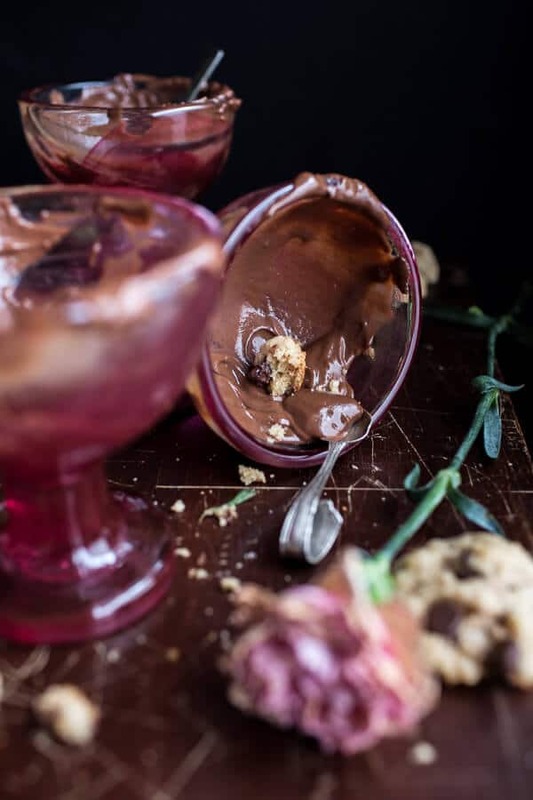 And Kahlua in pudding…OMG! Me & the kids had for movie night, watched Monster House. Was a big hit! Awh how sweet! I am so glad you all enjoyed this recipe! Thank you Karen!